First, please do take a look at this post if you haven't seen it already. This one’s too important to have been missed. Please contribute generously to help Bri and her family. Let us all keep her in our thoughts and prayers. I am home alone a lot these days and rarely feel like making something nice just for myself unless it’s blog-worthy. I usually make do with leftovers or store-bought frozen meals or even cereal (yes, sometimes I like to have it not just for breakfast, but for lunch and dinner too!). Today I felt like making something special for myself. I was going through my blog list of old favorites and came across Mika’s blog. I went through her archives and saw this recipe for Mysore rasam and decided that it just had to be tried out immediately. I make rasam frequently, but this was something I had only eaten at the typical South Indian hotels back home, and had never prepared before. So I got to work in my kitchen. Cook the chopped tomato cubes in tamarind water to which turmeric powder and salt have been added. In a small pan, roast the above mentioned ingredients in a bit of ghee. Cool and grind to a paste. Add the ground paste and the cooked toor dal to the tomato-tamarind mixture. Adjust to the consistency you reqire by adding desired amounts of water. Bring to a boil. Season with cumin and mustard seeds. Garnish with coriander leaves. Serve hot. That was such an inspiring click for Bri TBC... God Bless Her. 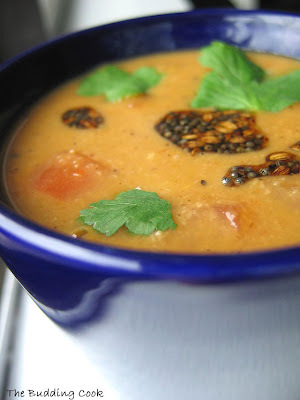 I don't think I've ever tasted mysore rasam.. have bookmarked your recipe... looks fabulous. I have had Rasam that's more thinner in consistency...resembles a sambar right? A lovely gesture for Bri.. Even I wanna take part in the Click event now.. The rasam looks good and a simple and quick thing to make when "Home Alone".. I see Fundraising is doing very well. Very inspiring click. Beautiful Rasam. that's a wonderful click for Bri. May god bless her! Mysore rasam look delicious. That's one really touching Click, TBC. And a mouthwatering rasam recipe too. That was a nice click. Looks good. Mysore rasam looks so YUM!. I really want to try this. Love rasam a lot. What a kind picture for click. I love rasam too! That looks nice, and the formation is great for support! Beautiful and a very thoughtful click! Swati- Please do whatever you can to be a part of Bri's fundraiser. Asha- If it progresses at the rate it is doing right now, I don't see why the goal would not be reached in another week or so. Sangeeth- welcome, and thank you! Ooh..the rasam looks mouth-watering. I completely understand the cereal-for-breakfast-lunch-dinner thing; I'm guilty of the same! Nice entry for click! Liked the idea! Mysore rasam looks great. have tasted it but never made, will try it out. wow! TBC the rasam looks great:) I've been looking for a rasam recipe and now I'm glad I have yours. About living on cereal....I do that a LOT too, esp when I don't want to cook due to the amount of pots and pans that will need to be cleaned! have eaten mysore rasam in the past..but have never made it..bookmarked! 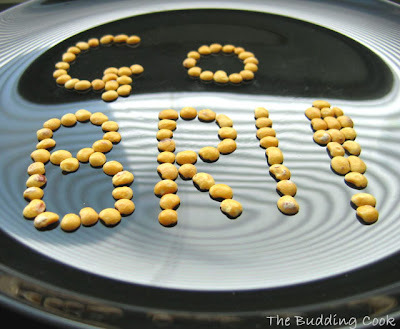 What a nice tribute to Bri... Love the recipe. TBC, this is a lovely click. Thank you for dropping by just wanted to pass on a tip that Alka from www.sindhirasoi.com passed on how to cook fresh Bhees. She tells "It is neccessary to boil the bhee in salted water with a little piece of sinshi papad, if you do not have sindhi Papad a few drops of oil will also do." - Then cook the curry as normal. TBC, thank you so much for your loving support. Your click! entry is great fun. I wondered if it was dried beans or nuts, and now I know :) It's so sweet of you to make a second post too, to keep the fundraiser present. We've had such an overwhelming response, but I figure it will slow down once bloggers get back to normal blogs. Thanks again for your sweet kindness. Mysore rasam looks hot and yummy, I have to go make some for miself now.. Coming down with the rhinovirus and what best treatment but hot and steamy peppered rasam. Wonderful Mysore rasam:) very yummy! Enjay- I love your chickpeas pic! Give me some feedback when u do make it, o.k.? Raghu- welcome, and thank you! Bri- I am very happy to be a part of this fundraiser and am only glad that I could be of some help. You are a very strong and courageous young woman who deserves a second chance. You are a fighter and we're all here for you. You are in my thoughts and prayers, dear Bri.